Spirit's Destiny follows the path of one Ella Bland, who having just finished a degree is looking forward to living on earth (a right for attending 4 years of university). The very last thing she ever expected was to become embroiled in an ancient, bloody and quite secret war between a genocidal artificial construct hell-bent on destroying the human race and a deeply shrouded organisation that will do anything to prevent mankind's annihilation. As the violence escalates between both sides, Ella must put her trust in a young secret agent and an unusual female droid if she is to have any chance of escaping this gory nightmare alive. As she becomes deeper entrenched in this anarchistic quagmire, Ella discovers her role in this conflict will be far greater than she could ever possibly imagine. There is a great deal to like about Spirit's of Destiny, the narrative is well written with a short and uncluttered but descriptive sentence structure. The characters are pretty interesting too, especially the protagonist Ella who is a far cry from the typical hero. The pace is quite energetic, although most of the first few chapters are spent character building and providing some back-story, persevere though and once Ella boards that ship it speeds up substantially. While I do feel that a little bit more editing wouldn't have hurt the author has managed to avoid the trap of dumbing down the story and structure for Young Adults - something too many authors who write in the genre fall foul of. Within 0.0000057 seconds: Eclipse had analysed its surroundings. 00123 seconds: Eclipse became self aware of its own existence. This is also true of the overall story arc and I kept coming across bits and pieces I recognised elsewhere. Despite this lack of total originality I did find myself enjoying the book, the story is entertaining and the character of Ella very well played. 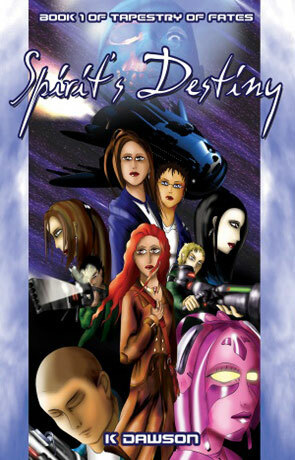 Spirit's Destiny is one of those books that does manage to grip you in a vice like hold for the majority of the journey (along with the "to be continued ending") and I would expect most Young Adults will very much enjoy it - as will many older one's too. Written on 30th January 2012 by Ant.